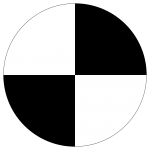 The volunteer “Take A Dip” Secchi Disk program was initiated by CLWA in 2010, and has proven to be an important component of the overall water quality monitoring efforts on Canandaigua Lake. Our group of dedicated volunteers provide critical data that notifies us of changes in lake health. In 2015, secchi disk volunteers were some of the first to notice a drop in clarity, which then lead to the first major blue green algae event on Canandaigua Lake. Secchi Disk volunteers use their own boats to go out on the lake and take weekly clarity and temperature readings. Findings are reported electronically, which makes real-time response to a possible critical condition possible. The additional data gathered by volunteers helps us supply more detail to the ongoing “picture” developing of Canandaigua Lake. Click on the location to see the volunteer’s most recent reading. 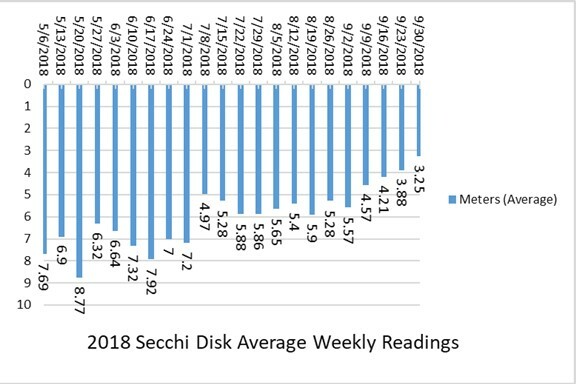 The below chart illustrates current weekly average secchi disk readings collected by the 2018 CLWA volunteers. Data is updated weekly. Thanks go out to our long standing volunteers: Dee Crofton, Gary Helming, Kevin Hefner, Scott Hill, Bruce Kennedy, Marty Lasher, Wade Sarkis, Lynn Thurston, Vickie Tucker, Bill Yust, Steve Zumbo, Kathy Bromley & Greg Talomie, Amy Bowen, Rob Gray, Nadia Harvieux, Bill Mehls, David Schwaner, Brian & Dolores Perkins, Sue Ford, Maggie Benham, Brad Kellog, and Scott Kreher. Secchi Disk reading have taken a dip since early September with the increased algal activity around the lake. Many of our volunteers also sent in HAB reports, which has been tremendously helpful to assess lake conditions. Several sites were vistited for sampling. As always, please notify us if you see any suspicious algal actvity while out taking your readings! We currently have 17 secchi disk volunteers, and are looking for more individuals to assist! Data gathered from these sites supplements the FLCC data taken monthly at two mid-lake locations. On a lake of the size and diversity of conditions as Canandaigua, more sites and data are needed. For more information, contact the CLWA office at (585) 394-5030 or email us. You can also check out the sampling protocol sheet for more infomation here.